There are many great celestial events. Many of these have Magickal qualities to them, and can strongly affect both our lives and the Magick that we use here on Earth. However, there is one that has a special significance. When a Lunar Eclipse occurs, it brings a silence and a special stillness into play. There is an energy unleashed that many of us feel deeply within us. This particular event is not one that happens on any sort of regular basis. There is often a great outflow of energy when a full moon occurs, but an eclipse of the moon is a different situation altogether. The actual eclipse, in a total sense, of the moon only occurs on very select dates. For example, we have upcoming total eclipse that will be visible from all of North and South America on April 14th 2014. We will not have another hint of an eclipse like this for another 6 months. Eclipses last only for an hour at the very most, before the brief ballet is over and the moon returns to normal. They are short and shocking, and they don’t come along very often. One of the most stunning aspects of the lunar eclipse is the coloration of the moon to our eyes. If you like at a partial or total lunar eclipse, you may begin to think your eyes are deceiving you, as the moon turns red. You should not worry, thankfully! You are viewing a spectacular atmospheric effect that does not have a parallel anywhere. 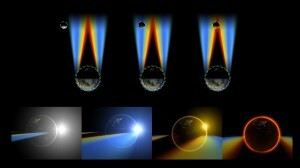 The color changes because the sun’s light has to travel through the Earth’s atmosphere to reach the moon. You know what color the sky turns at sunset, when the light is stretched across the sky? That’s right – it goes a wonderful shade of red. The filtering of the light through our atmosphere causes the moon to turn this powerful color. This is a powerful connection that binds the two bodies together in a way that is truly ancient. Many ancient peoples looked up at the eclipse and could feel the significance of such an event. Lunar events are known to have played a part in ancient Mayan, Aztec and Egyptian ceremonies. Many of these peoples had great respect for the interplay between the cosmic bodies. The appearance of such a spectacular event had a great significance for them. The importance of solar and lunar goddesses in these societies shows the level of attention that they paid to these kinds of events. 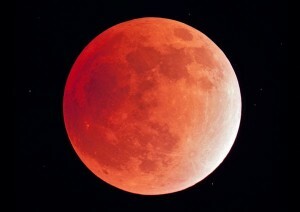 There is strong evidence of festivals and ceremonies accompanying the appearance of a lunar eclipse. Their eyes were open to the drama going on above them! The blocking of the sun’s energy from reaching the moon is referred to as the ‘umbra’. This is divided into two sections, the ‘preumbra’ of partial darkness, and then the complete darkness when the sun is totally blocked off by the position of the Earth. The umbra plays a very special role in the change in the energy flow that the eclipse underlines. This shift in the energy flow is what makes lunar eclipses stand out, as opposed to new and full moons. They are real events, which leave lasting effects on the balance of the cosmic bodies involved. For this reason, they cannot be ignored from a Magickal and ceremonial point of view. The way in which those who use the Craft can benefit from the lunar eclipse is considerable. It is a change in the current of energy, with the Earth interceding between the sun and the moon. There is a hypothesis that the filtering of the sun’s rays through Earth’s atmosphere helps to strengthen the link between us and our satellite – a kind of elemental transference. Many believe that the eclipse itself helps to strengthen and empower the moon, as period of darkness allows it to shine all the brighter when it returns. There is an ongoing discussion regarding a transformative, ‘new system’ that is formed during a lunar eclipse. Rather than being separate sun, planet and moon, a new entity is briefly formed. This makes the eclipse a gateway of kinds, a moment where we are allowed to step through a gateway to a new and deeper understanding of the solar family. 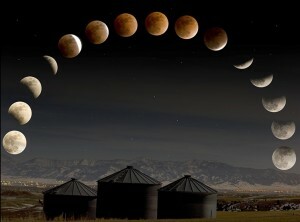 The importance of the lunar eclipse is therefore particularly strong in Wiccan and Magickal circles. It is an open display of how all the bodies in the cosmic sphere interact with each other, and it is known to open up a fissure of great primal energy as the umbra comes into being. For this reason, it is a highly anticipated and celebrated event. Where will you be when the next lunar eclipse unfolds on April 14th? Will you take advantage of the surge in Magickal energy? Feel free to contact us and join the discussion on our Facebook Page as we approach this extra special night.